Outside Online has the story of Alex Bellini, an Italian explorer who plans to make a year-long trip inside this floating survival capsule. 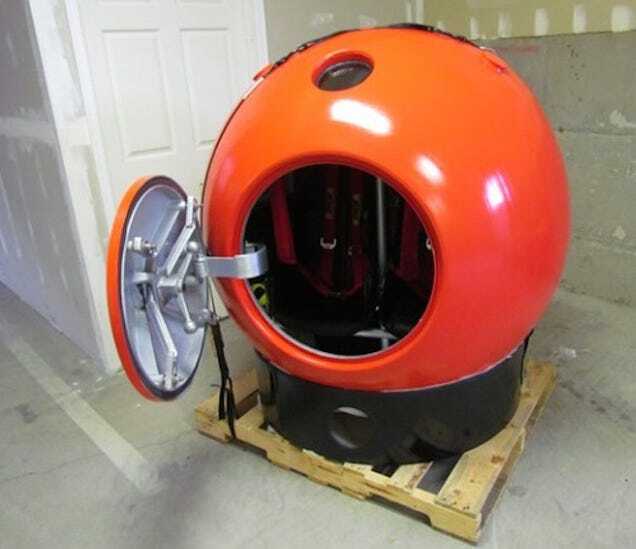 It was originally designed by engineer Julian Sharpe as a rescue pod for two to ten people in tsunamis. Bellini is tearing out the extra seats and making a one-bedroom apartment out of the aircraft-grade aluminium orb, which has an inner lining that rotates so the floor inside will always remain level. Of greater concern are the physical and psychological tolls of ball-living. Solar panels and a turbine will power the craft (and provide him with Wi-Fi, thank goodness), but Bellini will not be able to venture outside the womb-like apartment very often. He plans to use a stationary bike and install an illumination system that simulates natural light.